Located on the Western Ghats, the hill station of Mahabaleshwar is set in the midst of a dramatic landscape comprising evergreen forests, lakes, rivers and waterfalls. Since its discovery in 1828 by British governor Sir John "Boy" Malcolm this picturesque hill resort in the Satara district of Maharashtra has been luring visitors who will be startled by its abundant greenery and exquisite scenery. Apart from some of the fine relics of British colonial architecture evocative of another era, Mahabaleshwar, once the summer capital of the Bombay Presidency during the British rule, offers an ideal escape from the steaming coastal plains of Maharashtra and the surrounding areas. The unofficial honeymoon mecca of Western India, Mahabaleshwar is home to a number of vantage points which offer the unmatched view of the surrounding areas. 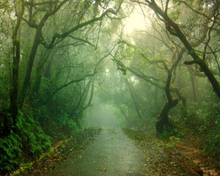 Main Rd, also called Dr Sabane Rd is the famous stroll-through destination in Mahabaleshwar. 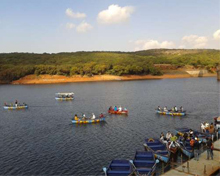 Surrounded by green trees on all sides, the Venna lake is one of the top tourist attractions in Mahabaleshwar. Visitors to the lake can avail of boating facilities in the Lake. They can also indulge in pony riding and fishing. Watching the sunset and sunrise from Wilson Point is one of the best things to do in Mahabaleshwar. A top tourist destination of Mahabaleshwar, Kate's point is blessed with stunning natural beauty. Located to the east of Mahabaleshwar, the point is an ideal place to view the reservoirs of Balakwadi and Dhom. Nine km from the town of Mahabaleshwar, Arthur's Seat is a captivating tourist destination among the tourists who come to Mahabaleshwar to marvel at the scenic grandeur. The view of the Savitri River from this point will be a feast for your eyes. Needle Hole Point is yet another point located high up in Mahabaleshwar. Also known as the Elephant Point it provides excellent view of the places nearby. Located near Kate's Poin, Elephant Point is so named which the cliff resembles. Bombay Point, Babington Point, Connaught Peak, Chinamans Waterfall, Dhobi Water Fall, Helen's Point, Hunter Point, Lodwick Point, Kate's Point, Marjorie Point are other places of attractions in Mahabaleshwar. Old Mahabaleshwar is known for its shrines of Krishnabai, Shri Ram and Hanuman and the Mahabaleshwar temple after which the place is named.